Whiplash is a common term used to describe neck injuries suffered in an accident. Anytime the body endures a sudden impact, twist or jerk there is the potential for a whiplash injury to occur. It is important to understand the causes of whiplash and its symptoms because whiplash injuries can become progressively worse if they are not properly diagnosed and treated. Anyone who has suffered a neck or back injury in an auto accident should seek immediate medical attention from a doctor and legal guidance from our experienced NH whiplash injury attorneys. Whiplash refers to many different types of neck injuries. Examples of these neck injuries commonly classified as whiplash include soft tissue cervical hyperextension injuries, cervical sprains and cervical strains. Whiplash injuries involve the back, neck or head being jerked, twisted or shaken. Car accidents are the most common causes of whiplash injuries. In fact, victims of New Hampshire car accidents can suffer a whiplash injury at speeds as low as 15 mph. Whiplash injuries can occur whether or not a seatbelt is worn and regardless of whether the victim's head makes contact with the steering wheel or dashboard. Neck injuries can be debilitating and they often negatively affect the victim's quality of life. If you are experiencing whiplash symptoms such as neck pain, shoulder pain, weakness in your arms or legs, dizziness or headaches, you should seek prompt medical attention. Not all neck injuries require hospitalization, but it is often in your best interest to see a doctor. Your doctor may prescribe a soft cervical collar to relieve pressure. Doctors are trained to look for trauma to the spinal cord, bruises, cuts and abrasions, and in severe cases, they might take an x-ray to make sure there are no fractures. Treatment may involve rest and the application of ice and prescription pain relief medication. Other forms of treatment include bed rest, massages, ice therapy, heat therapy and range of motion exercises. Most patients recover within twelve weeks, but some symptoms may persist even longer. Proper and effective healing takes time, energy and treatment. You don’t need to deny or minimize your injuries! If you have a good team taking care of you it may help prevent future potential for the injury to have longer-lasting effects on your life. The experienced New Hampshire personal injury lawyers at Tenn And Tenn, P.A. 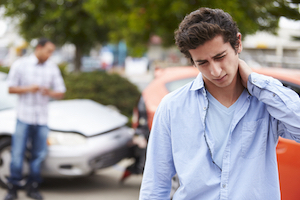 have a long history of helping whiplash victims receive the compensation they need. We help our clients hold the at-fault parties accountable for the injuries they caused. If you or a loved one has been hurt in a car accident, please do not hesitate to contact our offices today at 1-888-511-1010 for a no-cost consultation and a comprehensive evaluation of your potential injury claim.